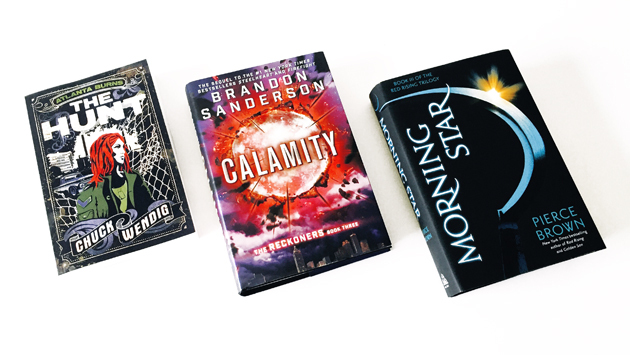 February was such an amazing bookish month, I wish every month would be like this when it comes to new book releases (though this would probably be disastrous for my TBR and my account balance…^^) Here are all the great books I got last month! 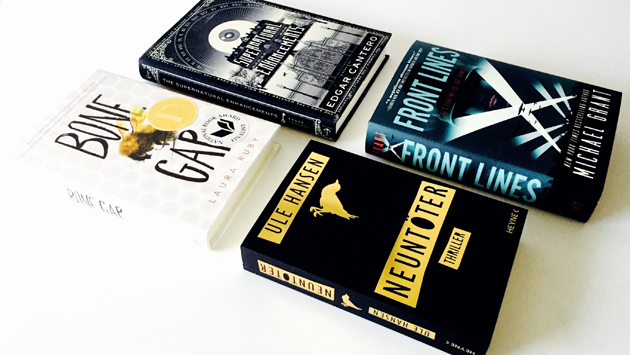 I usually don’t have a lot of pre-orders because I only pre-order books that I really need to have on the first day (or when it comes to English books: as close to the release date as possible because you’ll never know when the German online stores decide to ship them…), so February was quite exceptional with even three books that I had already ordered for months. Pierce Brown’s „Morning Star“, the final installment in the „Red Rising“ trilogy, was probably the most anticipated one because I couldn’t wait to get to know the ending of this series (I’ve already read it, it’s awesome!). My last February pre-order was Chuck Wendig’s second Atlanta Burns novel „The Hunt“. To be honest I don’t plan to read it that soon but I just couldn’t wait to see this amazing cover in real life and put the book next to the first one which looks just as stunning. At least Valentine’s Day is good for something because Thalia had a 14% discount for a few days, so that I just had to order a few books – especially since they were already cheaper than they used to be, so that with the additional discount I just couldn’t resist. That’s why I spontaneously decided to order the new Michael Grant novel „Front Lines“ even though I’m already in the middle of two Grant series (Gone & Messenger of Fear), but I heard so many good things about this book that I took the chance and bought it – and wow, it’s so huge! I also bought two books that have been on my wishlist for ages but which I didn’t buy because they were always too expensive, but – lucky me! – the discount came at the right time when they already were at a reduced price, so I finally got „Bone Gap“ by Laura Ruby and „The Supernatural Enhancements“ by Edgar Cantero. I’m especially excited about the latter because the story is told through journal entries, letters, reports and stuff like this and I absolutely love this kind of narration. When a few friends and I celebrated our annual bookish Secret Santa Christmas tradition unfortunately my package from Crini got lost while shipped and did a little odyssey through Western Germany but I finally got it last month and it was absolutely worth the long wait! 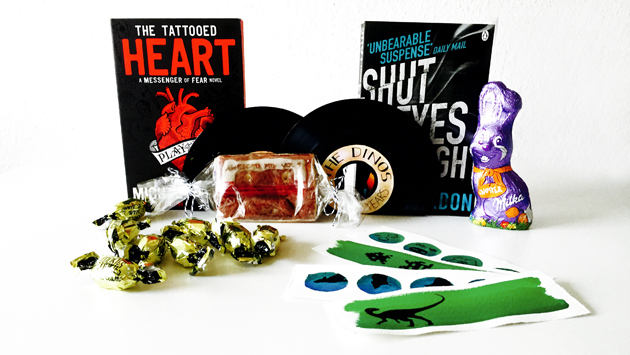 I not only got two books from my wishlist („The Tattooed Heart“ by Michael Grant and „Shut Your Eyes Tight“ by John Verdon) but also some sweets, two cool bookends out of old vinyls, a literally awesome Guardians of the Galaxy cookie and four of Crini’s Skinny Hues bookmarks which are not only in my favorite color but also have some amazing designs – I guess it’s no surprise that the Dinosaur one is my favorite? 😀 Again, thank you very much! I only got one eBook last month and this was a review copy from Netgalley. I’ve already read and reviewed „A Death at the University“ by Richard King and had quite a good time with this cozy crime novel. „Papierjunge“ by Kristina Ohlsson was one of my most anticipated audiobook releases of the year because the Fredrika Bergman & Alex Recht series is one of my favorite crime series. I’m already in the last part of the book and it could totally live up to my high expectations so far! I also got „Labyrinth – Elixier des Todes“ („Blue Labyrinth“), the 14th novel of the Agent Pendergast series by Douglas Preston and Lincoln Child, and the new psychological thriller „Wer war Alice“ („What She Left“) by T.R. Richmond and I’m looking forward to listening to both stories a lot! 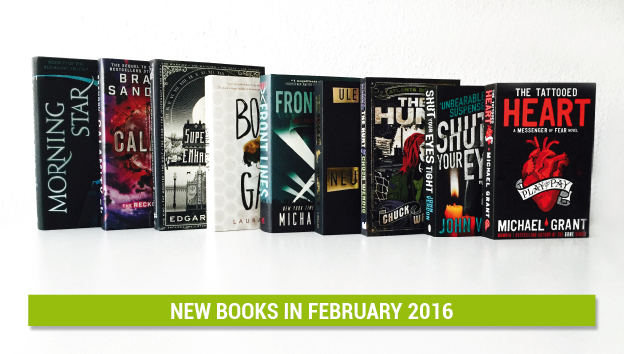 Which new books did you get in February? Good, then you can remind me! Lol, I guess that would have helped. xD I think I got all of them from the library after I read the first one. Ich bin auch sehr gespannt auf das Buch, vor allem weil ich auch die Erzählweise mit Berichten, Briefen, Tagebucheinträgen etc. total mag.